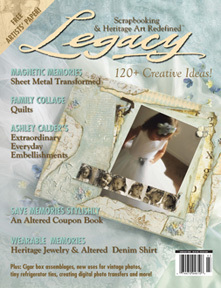 I am excited to announce that a project of mine is in the latest issue of Legacy (June/July 2006) Magazine. It is called "Magnetic Photo Frames" and incorporates the integration of sheet metal into our preservation of memories. I love how the photos can be removed and replaced since they are held onto the frame with magnets. Wire or ribbon added to the top of the frames make them easy to hang on the wall, door knob or they can be placed onto a photo stand. I suppose they could be placed on the refrigerator with magnets on the back to hold them in place. I haven't tried that, yet. The sample page from the magazine below features my friend, Renee's two children.